What do you do, when you work on a project for a while (well, a long while, almost 2 months) and hope to finish it soon, already anticipating how, when and with which clothes you’ll be wearing it, and then suddenly (yes! Suddenly, because where were your eyes all this time I don’t know, but certainly not on your project) you discover that it must be unraveled because it looks ugly? Has it ever happened to you? If the answer is “yes”, and I hope it is, because I am not the only idiot in the world, it just cannot be true, so if the answer is “yes”, what would you do in this case? As for me, I need to put the unfortunate project aside, take a deep breath (several deep breaths, actually), and make something that would cheer me up. Next week we are going to London and see our older child. So I decided to make something for her. The question was – which yarn to use? I bought Shetland Spindrift wool a couple of years ago, when I saw some patterns by Martin Storey (honestly, I don’t even remember now which ones). But when the yarn came in the mail I was disappointed. First, each ball has only 25 g and 105 m of yarn in it. Not much. Since I didn’t pay attention to the yardage while ordering (yep! I know! ), I didn’t order enough. But this wasn’t a major problem. I could order some more. 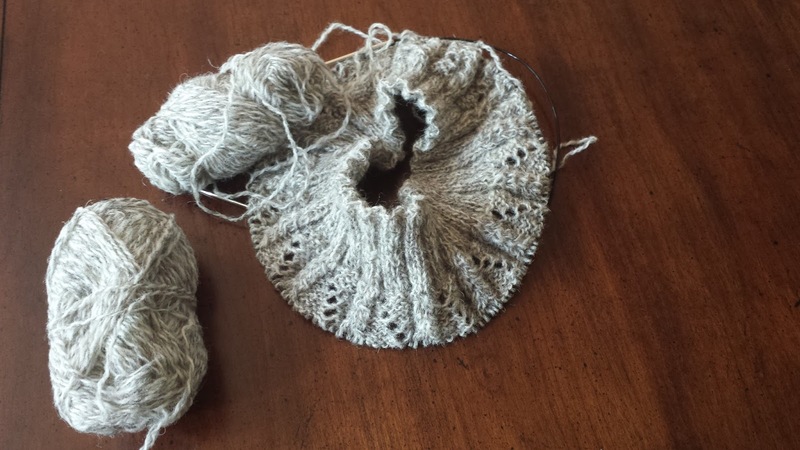 The problem was that I didn’t like the yarn – it looked too rustic and uneven, too homespun for my taste, plus it seemed to be scratchy and splitty. So, like any normal intelligent human being, I just put it in a bag and hid it somewhere in my stash. Looking for yarn for my new small projects I rediscovered it, made a gauge, and was pleasantly surprised at how well this yarn felt and looked when knitted. And it wasn’t scratchy or splitty. And I had enough for a pair of socks, or a hat, or a couple of hats. Actually, this yarn reminds me of Buddhist monks. It is called Spindrift – something spinning like a prayer wheel, something drifting like your thoughts during a meditation, something round and calming like a mandala. Try working with it – hopefully, you’ll feel the magic like I did. Still, I decided to start with something for myself – to see how it will look in a finished project. 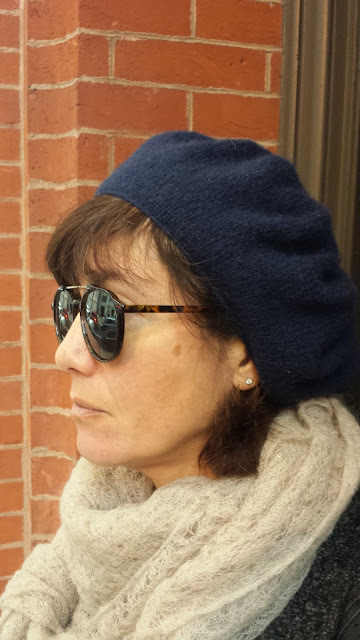 For a while now I wanted to make myself a blue beret. At first, I found this pattern but then rejected it because it looked too homemade. I wanted a hat that looked like something that you can buy in a store. And then I found this darling little beret. It looked adorable on pictures and it was a free pattern, another bonus. 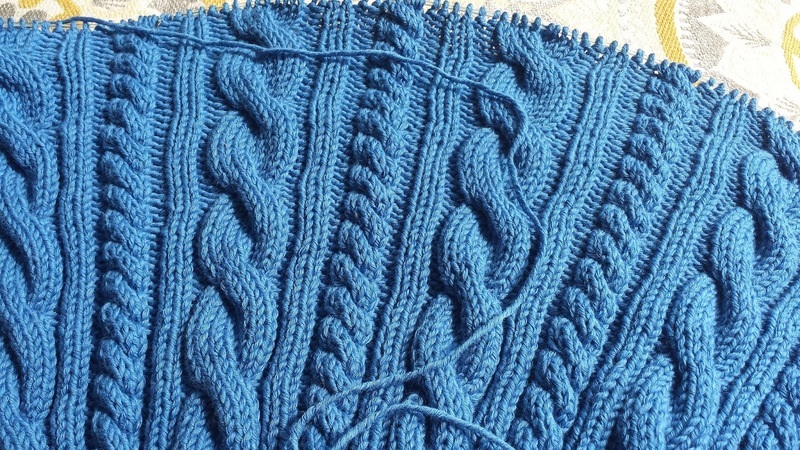 So I promptly downloaded it and started knitting it from Shetland Spindrift in dark blue. Perfect color for me. My only two problems with this pattern are its length (12 pages of explanations for a simple, made in a round stockinet hat seem to be excessive and are full of repetitions) and the amount of cast-on stitches for the adult size. I followed directions and casted on 90 sts. After a while I tried this on and, no surprise, it didn’t fit my ginormous head. So I restarted with 120 sts and after this it was smooth sailing. At the end I tried to felt it by hand in very hot water, failed, but discovered that the yarn didn’t bleed at all. Yey the yarn! So the felting was done in the washing machine. I call this hat The Elixir of Love. 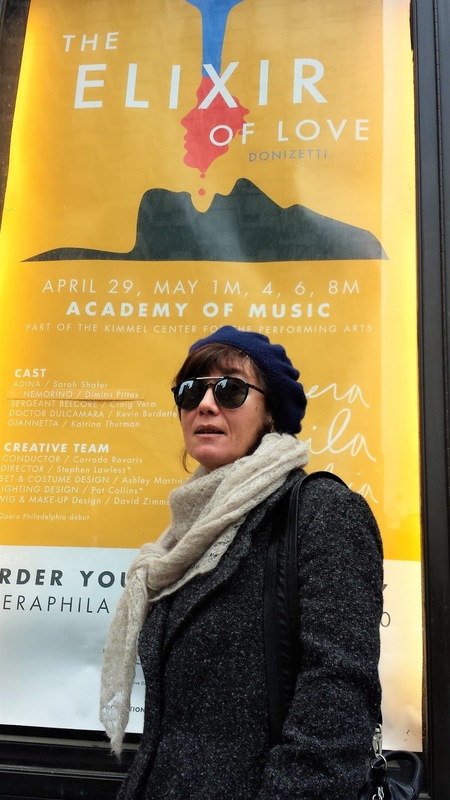 First – because I wore it for the first time when we went to the opera of the same name. Second – because, in a way, it was an elixir for me, a salve for my bruised ego, a balm for my frustrated soul. All in all, it was a success (the hat as well as the opera). And a person needs some success after a big failure. At least this particular person. You can see more pictures and read more about the hat here. Now I knew I could use this yarn for gifts. First, I made a pair of socks from Veronik Avery’s book Knitting 24/7 that I like a lot. I’ve made mittens from this book 4 or 5 times as gifts and I was eyeing these socks for a while. The pattern is very well written. If you read it carefully and then follow it, nothing can go wrong. The socks were made in record time for me. Because, to tell you the truth, I hate making socks! 3) and then, after all this work, they get ruined by wear almost instantly so what is the point in making them? I know, I’ve heard so many times from different knitters “You need to have a sock in the making to take with you to a doctor’s appointment”. Personally, I can take anything to a doctor’s appointment, even a blanket (not that I make that many blankets, but I digress). Doctor’s waiting room seems to me not to be especially conducive to concentration required for sock making. I make socks rarely, on special occasions, for some special, “sock worthy” people. Like, for example, Sister Kathy Letts, who was the Dean of Studies in the school where I used to work. Dear Sister Kathy, I doubt that you read this, but you are one of the most “sock worthy” people that I’ve ever known. Thank you for everything! So, my daughter is definitely in the group of “sock worthy” people and she wears my socks mostly to bed, thus insuring their longevity. And I preemptively apologize for ranting about socks here, but this is the only time and place when I can do it, so – why not? After having made socks, I started a hat. Also for my daughter. When she was living in Edinburgh she would wear them even in summer. My first try was Kim Hargreaves’ Kat from Precious. I’ve made this hat so many times already and it is perfect as a gift. 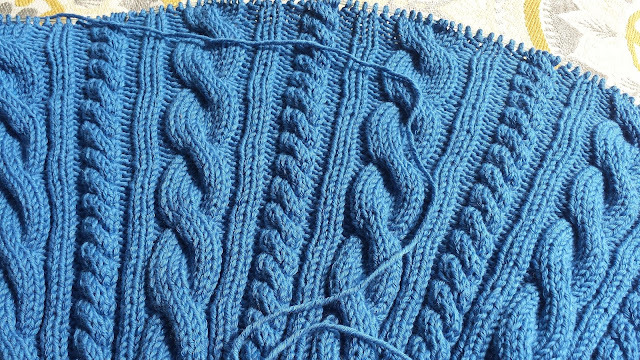 Yet, for this yarn it was too small and I didn’t want to recalculate everything so I just took a pattern from Kim’s last book – Wilder and made it in wool instead of cotton. I’ve already explained all the process here, so I won’t repeat myself. The hat is slouchy, warm, and cute. I still have some Shetland Spindrift left and I’ve been thinking about making a long warm fairisle cowl/scarf from the leftovers. We’ll see. First, I need to come back to my “big failure” and rework it. After all, I got a little confidence boost from my successes with hats and socks, I took a step aside and don’t see it as a total disaster anymore. And I still want it as a garment. You are not very neurotic, and you are a fabulous knitter! I did not know that you hated to knit socks... They are complicated enough and small enough to hold my attention. I cannot imagine spending the hours it takes to knit a sweater. However, I am bored with my recent tiny project that is too simple to be mentioned in writing. Your friend, S.